We will be the recognised leader in environmental lift Health and Safety excellence - not just in our industry, but all industries worldwide. We will not be satisfied until our workplace is free from hazards, our employees are injury free, our products and services set the standard for safety, and our commitment and record in protecting the natural environment are un-matched. We actively champion safe behaviours of our people. Always use your safety tools and equipment. Report and stop all unsafe practices as all injuries, illnesses and environmental incidents are preventable. Every one of us should return home at the end of every workday in the same condition we arrived. Encourage and reward safe behaviour. We practice and promote safe and environmentally sound practices around the world. We comply with all environmental lift health and safety laws worldwide. We design and integrate Environmental lift Health and Safety into our products, facilities and management systems. We are all accountable for keeping people and places safe. Each of us is responsible for our own safe behaviours and those of our co-workers. Each of us is empowered to take any action necessary to eliminate the potential of an injury or environmental incident. Environmental lift Health and Safety is led by senior management and implemented by line management, with each level accountable to the one above and responsible for the one below. We design work processes that allow us to perform our jobs in the safest way possible, while delivering the highest quality products and services to our customers. 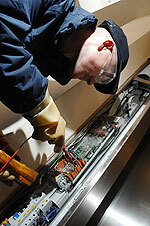 We provide all Otis lift employees with the necessary knowledge, skills and abilities to work safely. We consider environmental lift health and safety every decision we make and in every activity we perform. We relentlessly focus on improving our Environmental lift Health and Safety processes. As a subsidiary of OTIS Limited, who, in turn, is part of United Technologies Corporation, PDERS are recognised members of the Lift and Escalator Industry Association. PDERS undertake to support the aims and objectives of the Lift and Escaltor Industry Association. As a subsidiary of OTIS Limited, who, in turn, is part of United Technologies Corporation, PDERS are recognised members of The Royal Society for the Prevention of Accidents (RoSPA). PDERS supports RoSPA’s mission to save lives and reduce injuries. As a subsidiary of OTIS Limited, who, in turn, is part of United Technologies Corporation, PDERS are recognised members of the British Safety Council. PDERS is committed to working towards Health, Safety and Environmental Best Practice.